Lumas are star-like creatures that first appear in Super Mario Galaxy. Unlike most Stars, they have a rain drop-like shape and come in many colors, with the most common one being yellow. They are much like Power Stars, but are more circular and have the ability to talk. The Lumas are each very friendly and assist Mario during his quest. Lumas have the ability to transform, from minor planetoids to entire galaxies, and according to Rosalina, some Lumas can even transform into Power Stars. They call Rosalina their "mama." Most of them make their home with her in the Comet Observatory, and others live on Starship Mario following their leader Lubba. Their name comes form the Latin word for light, lumen, which is a reference to their future as stars. In Super Mario Galaxy 2, if the Co-Star Luma spins one, it will emit three Star Bits. Paper Mario featured a similar species, called Star Kids. Like the Lumas, the Star Kids were young stars, who were raised on a special place to become real stars someday. They also possessed magical abilities, like the Lumas, and a very similar, childish behavior. In addition, Blue Lumas look similar to an item in Paper Mario: The Thousand-Year Door called Mini Mr. Mini. In Super Mario Galaxy, various Lumas appear on the Comet Observatory and in different galaxies, and Mario is accompanied by a uniquely apricot-colored Luma, who was given to him by Rosalina at the beginning of the game. Luma grants Mario the power to do spins. While he is the only cream-colored Luma encountered by Mario, the Luma that transformed into the beacon that powers the Comet Observatory is shown to be the same color in Rosalina's storybook's illustration. Yellow Lumas transform into Sling Stars and Launch Stars and are the most common variety. Red Lumas guard Red Stars. Green Lumas are the guardians of the Trial Galaxies and transform into green Launch Stars and Green Stars. Blue Lumas transform into Pull Stars. Pink Lumas transform into pink Launch Stars to get to Hungry Luma galaxies. Lumalee, who is a large, light-blue Luma, hosts the Luma Shop. There is also another type of Luma that is pink, known as the Hungry Luma. The last type of Luma is the Comet Tico, which has the ability to move Prankster Comets. There is also a blackish-brown Luma named Polari, who acts as a guide to Rosalina. In the end, all the Lumas (including Mario's Luma) throw themselves into the massive black hole created by Bowser's dying sun to neutralize it. However, Luma is reborn and living on a small planet while it is hinted that the other Lumas will be reborn later. Lumas also appear in Super Mario Galaxy 2. Some time before the beginning of the game, Bowser attacked Lubba's ship, and many of the Lumas on board fell down to the Mushroom World. A large number of Lumas are shown to reside in Starship Mario, and their leader is Lubba. Hungry Lumas also appear; this time, they ask to be fed both Star Bits and Coins. Like in the last game, Lumas enjoy being fed Star Bits, and may thank the player if he or she decides to shoot Star Bits at them. There are exceptionally large species of Luma in the Supermassive Galaxy called Giant Lumas. Additionally, Mario's companion Luma returns; however, Mario doesn't seem to remember him, and he finds the baby Luma when he crashes onto the Mushroom World. Lumas appear in Super Mario 3D World where they can be seen floating around in the world maps as well as various levels in bonus worlds. Their behavior has not changed from the previous Super Mario Galaxy games, though the player cannot talk to them. In Mario Kart Wii, when playing as Rosalina, a Yellow Luma hovers around her at all times. It makes tiny noises whenever the player does an aerial trick or gets hit by an explosion. Although Lumas themselves do not appear in Mario Kart 8 or Mario Kart 8 Deluxe, a Luma is seen in the logo of Galaxy Air and a Luma's artwork can be seen on the back of the Star Cup trophy. Lumas also appear in the scenery of GBA Ribbon Road included in the second DLC pack. Yellow Lumas appear in Mario & Sonic at the London 2012 Olympic Games in the Dream Spacewalk event. Here, they aid the athletes in defeating Dino Piranha. They first transform into Launch Stars that send the characters into space. Following this, they periodically appear to create rings that the athletes must all pass through in order to damage Dino Piranha. In Fortune Street, Lumas appear in the unlockable Good Egg Galaxy board. A Luma can also be a customizable mascot for the player and is unlocked by placing first in all Mario series boards in the Standard Tour. A Luma makes a debut as a playable character in Mario Tennis Open. He is a Technique-type player and can be unlocked by completing level 3 of the Galaxy Rally special game, where, in the special game, he rallies the ball against players. His racquet is turquoise with a picture of a Luma on it. Red, green, and turquoise Lumas appear as line judges in the Galaxy Arena court. Also, if the player uses Luma in the Galaxy Rally game, the opponent Luma is blue. In Mario Tennis Aces, a yellow Luma appears during Rosalina's Tournament Finals introduction sequence. Also, when Rosalina uses her Special Shot, a yellow, green, and red Luma appear to each use a Star Spin to pass the ball to her. A playable Luma also appears as a character available from January 2019, reprising his Technical type from his previous playable appearance. Lumas make their Mario Party debut in Mario Party: Island Tour for the Nintendo 3DS. Yellow Lumas populate the space-themed board Rocket Road where players travel from one space to another in small spaceships. One of them is also holding the checkered flag at the end of the board, while another hosts Battle Minigames. Also, when one of the characters reach the finish line and is congratulated by Rosalina, a yellow Luma, a pink Luma, and a blue Luma appear as well. Lumas made their debut appearance in the Mario Golf series in Mario Golf: World Tour. 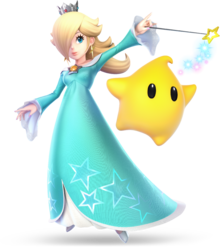 After players purchase the Star Pack and receive Rosalina as a playable character, Lumas appear alongside her in her post-hole animations. A yellow one is seen as she enters the tee box, when she earns a Star Coin or Moon Coin, and when she is displayed with the player's score if she was played as in a tournament. Although they are not playable characters, their ball and golf clubs are available for Miis to use. A Luma costume can be won if the player succeeds in a Character Costume Challenge in Yoshi Lake. Different colored Lumas appear alongside Rosalina as a singular new fighter in Super Smash Bros. for Nintendo 3DS and Super Smash Bros. for Wii U. As a team, a variety of Rosalina's attacks use these Lumas, especially to aid in combo attacks. Lumas have their own HP, and if they take enough damage, they get defeated. Lumas can get defeated by also knocking them off the stage to the point where they cannot recover. After a few seconds, another Luma respawns near Rosalina. If Rosalina gets KO'd, the Luma vanishes and a new one appears when Rosalina respawns. Lumas can attack even if Rosalina is stunned by other attacks such as grabbing, and their attacks depend on what input the player does as Rosalina. By using their standard special attack, Luma Shot, the Luma can be sent away from Rosalina to fight, and by using the move again it will be called back to her. There are six possible colorations for the Lumas: yellow, green, blue, red, apricot (the color of the Luma that joins Mario in the Super Mario Galaxy games), and dark brown with blue eyes (the colors of Polari). Lumas returns alongside Rosalina as veteran fighters in Super Smash Bros. Ultimate. When Rosalina gets stunned in battle, Luma now starts panicking, preventing it from acting while Rosalina is disabled. The yellow Luma also appears as a support spirit, which equips the fighter with a Super Launch Star at the start of battle when used. While no Lumas appear physically in Mario & Luigi: Paper Jam, a Battle Card depicts a Yellow Luma alongside Mario and Yoshi, taking their artwork from Super Mario Galaxy 2. Due to Mario Sports Superstars reusing Rosalina's golf animations from Mario Golf: World Tour, Lumas reappear in this game in the same capacity as Mario Golf: World Tour, appearing in her post-hole animations. Additionally, Luma themed gear appears in this game as an alternative choice exclusive to Rosalina. Lumas come in a variety of different colors, some of which have abilities to help Mario or Luigi on his adventure. 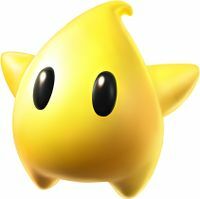 Yellow Luma Transforms into a Launch Star or Sling Star. Two giant ordinary yellow Lumas appear in Super Mario Galaxy 2's Supermassive Galaxy. Blue Luma Transforms into a Pull Star. Pink Luma Hungry Lumas that transform into new planets or galaxies before leaving behind pink Launch Stars. When Mario returns to the Comet Observatory after the Luma has transformed, it will be a regular-sized ordinary pink Luma. Also, if Mario wants to go back to the galaxy created by the Hungry Luma, then the pink Luma will transform into a pink Launch Star. When in their "hungry" state, they are an orange pink, but when in their "normal" state, they are a light neutral pink. Apricot Luma The Luma companion who accompanies Mario or Luigi throughout his journey and grants him the ability to spin is the only known apricot-colored Luma. Green Luma Four of them are found on the Planet of Trials after the Green Power Stars are collected. Cyan Luma Lumalees that sell Life Mushrooms and 1-Up Mushrooms to Mario/Luigi. In Mario Party 10, generic cyan-colored Lumas appear on the Rosalina Board. Red Luma The Luma that allows Mario to use the power of the Red Star on the Comet Observatory and the one in the ending sequence in Super Mario Galaxy 2 are the only known red-colored Lumas. Purple Luma Lubba, the leader of the Lumas, and the Comet Tico, that gives Mario information about Prankster Comets and moves them between galaxies, are notable purple-colored Lumas. A generic purple Luma appears in Mario Party: Island Tour on the Rocket Road board and in Mario Party 10 on the Rosalina Board. Black Luma Polari, Rosalina's companion who gives Mario/Luigi access to the galaxy map in Super Mario Galaxy, is the only known black-colored Luma. Orange Luma The Co-Star Luma, who serves as the Player 2 character, and a similar one found on Starship Mario in Super Mario Galaxy 2 are the only known orange-colored Lumas. Site Bio: Luma joins Mario Tennis for the first time! Luma floats through the air, aiming shots toward the far corners of the court. Bio 2: Luma has come down from the night sky to make his Mario Tennis debut! Though he may look gentle and fluffy, his clinical shots head straight for the corners of the court! For this subject's image gallery, see Gallery:Luma (species). Chiko "Tico" is an alternate romanization which may be based on Tycho Brahe, a famous astronomer. Sometimes rendered as 星の子チコ in Super Mario Galaxy, where 「星の子」 means "star child". ↑ シン (February 2, 2016). 【実況】ぽんこつ配管工 スーパーマリオギャラクシーでたわむれる　part1. Nicovideo. Retrieved May 12, 2016. ↑ RAN (November 10, 2007). 【スーパーマリオギャラクシー】絵本 第一章～終章. Nicovideo. Retrieved May 12, 2016. This page was last edited on March 19, 2019, at 15:53.